I’m not the best with heights, and would rather swim with great white sharks than attempt the existential horror of climbing ‘free solo’. Aficionados of this unhinged hobby scale sheer cliff faces without ropes or safety gear, with sometimes fatal consequences. 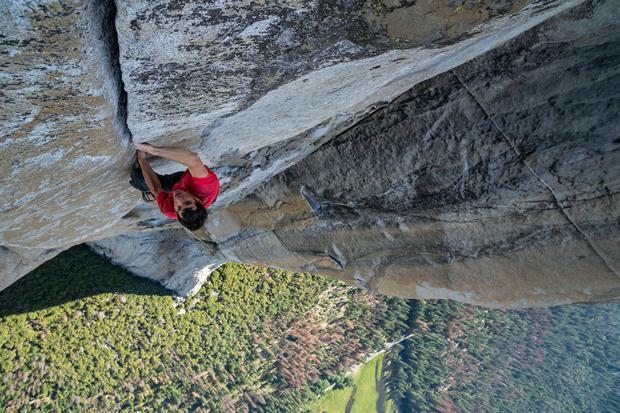 That does not deter the subject of this fine documentary, rock climber Alex Honnold, from taking on El Capitan, a 3,000-metre monolith in Yosemite National Park that’s so steep, the task seems impossible. Not to Honnold, who climbs New York skyscrapers for fun and seems to attain a zen-like calm when clinging to the sides of terrifying precipices.